What do these pedestrian crossings without the stripes mean. There is only a couple of poles with yellow stripes. ( are the same rules valid as with yellow stripes? ) And they are not respected by motorists! Last edited by omtatsat; 14.09.2018 at 07:52. Where there are stripes, the onus is on the motorist to stop, in anticipation, if it seems like a pedestrian wants to cross. Where there are no stripes (i.e. most of the road), it's at the pedestrian's discretion whether or not it's safe to cross. The so-called pedestrian island in your photo is a safe haven for a pedestrian who is daring to cross where there are, as you say, no stripes. It is a kind of compromise where it has not been deemed fit to declare the spot an official crossing, but it is known that pedestrians try to cross there anyway. This increases their safety, but they still have to pay attention, as fully as if they were crossing where there are no markings at all. The motorists don't have to stop. If there are no stripes on the ground, then it is not a (official) pedestrian crossing. The pic shows an abolished crossing, with the remains. 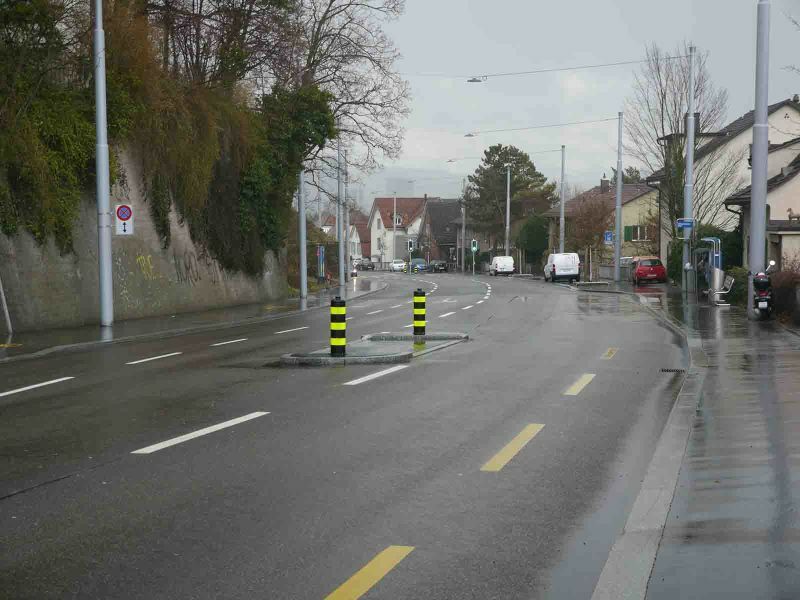 The poles with yellow stripes (=inselpfosten) do signal a traffic island to drivers, you can find them also on islands where there is/was no crossing. Thanks. Either it is or is not a pedestrian crossing. Whats an unofficial pedestrian crossing?? An unofficial pedestrian crossing is one which doesn't fulfil the norms, rules or regulations, so can't be so classified, yet it seems, intuitively, to be an obvious place where people will cross, so common sense demands that one acknowledge it, even though bureaucracy can't. Indeed. AFAIR there is a regulation that if a pedestrian crossing is nearer than 50m then you're obliged to use it. In all other cases it is "unofficial" and of course you're free to cross, but without the privilegies/"protection" of a pedestrian crossing. And the pedestrian islands AFAIK are prescribed if there are more than 2 lanes. Thus, it used to be a pedestrian crossing, but no longer is one, and they can't be arsed to spend the money to remove the island. Or they think it is probably safer for everyone - since common sense will prevail and people will use it regardless of a legal norm - just to leave the island there. Could well be a cantonal thing, but I know (after having been involved in discussions on the subject), that the canton (VD in this case) won't allow pedestrian crossings on cantonal roads outside settlements, but will allow the "safe havens" shown on the photos. In principle I guess this means that vehicles don't have to give way, but you have a spot in the middle to take refuge and cross the road in two steps. They probably replaced it with an expensive pedestrian tunnel which nobody can be arsed to use. Trainstation Seuzach comes to my mind re this "problem". not a cantonal quirk I think, it's some rules made up by some bureaucrat that changed and they abolished a bunch of crossings because of them in my canton of origin as well. I think they basically can't exist near curves anymore. It means the pedestrian has to walk briskly across the street with constant alert to oncoming traffic and not take their dam time, with their I have all day attitude and ha ha I made you stop and wait maybe I'll stop on the way across to light a zig. Last edited by robBob; 15.09.2018 at 10:56.